So we have supplì and we have arancini, which aren’t to be confused. 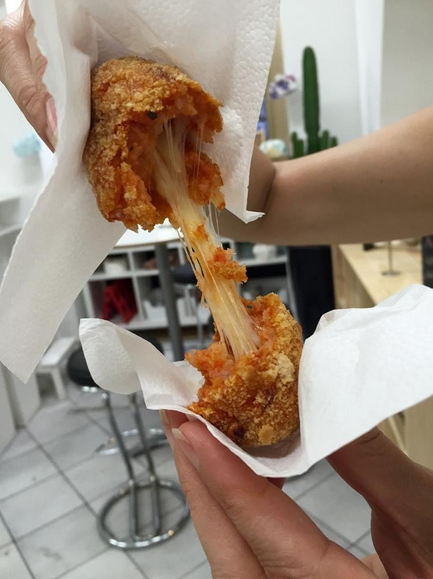 Both are stuffed rice balls coated in breadcrumbs then fried, and which are one of the most popular Italian street foods. 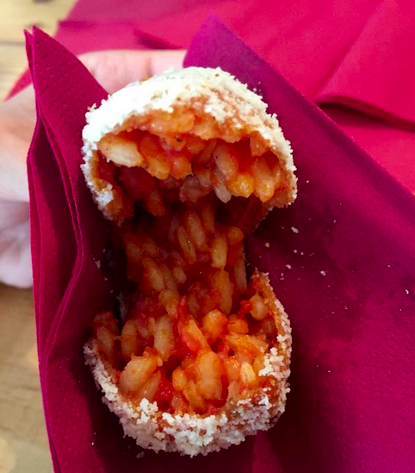 Apparently, supplì is a cousin of the Sicilian arancini (because rice balls have cousins) and traditionally they have a cheese filling, while arancini have a meat ragù and pea filling and tend to be a bit larger in size. Supplì is native to Rome. If you want to get really traditional, the first supplì were filled with chicken giblets or mincemeat. Now, they are stuffed with a piece of mozzarella that stretches like a string resembling a telephone cord when the supplì is split in half. This led to the nickname supplì al telefono. The most common supplì is a combination of rice, tomato sauce, and raw egg, typical to the Roman cuisine. However, supplì can also be prepared without tomato sauce, supplì in bianco. On the other hand arancini are said to have originated in Sicily. Arancini comes from the Italian word for orange, arancia, and arancina means “little orange” which is reminiscent of the arancini shape and color. The name actually changes according to what part of Sicily they’re from. In the eastern part of the island Sicilians call it arancina, while it’s arancino in the west side. The shape changes as well along with the location. In the east the arancini take more of a pear shape, whereas in the west they are more often rounded. 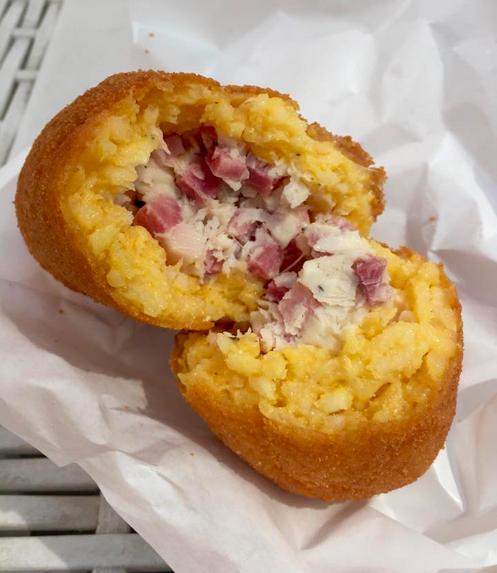 In Palermo and Trapani, arancini are eaten for the feast of Santa Lucia, when bread and pasta are not consumed to commemorate the arrival of a grain supply ship on Santa Lucia’s day in 1646. 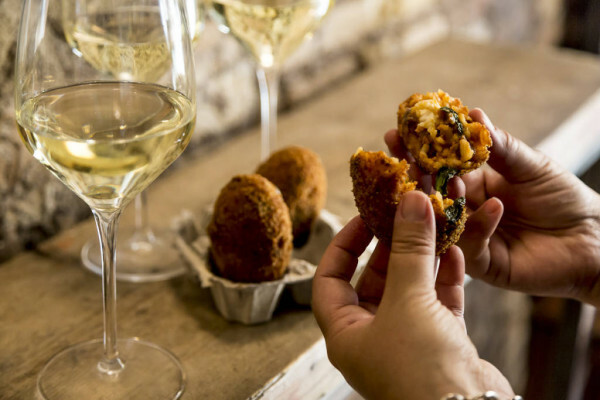 Both supplì and arancini are traditionally found in fried snack shops, but are also popular antipasti at pizzerias and other casual restaurants. With the increasing popularity of street food in modern Italian food culture, Italians have strayed from the original recipes and have become inventive with their offerings. 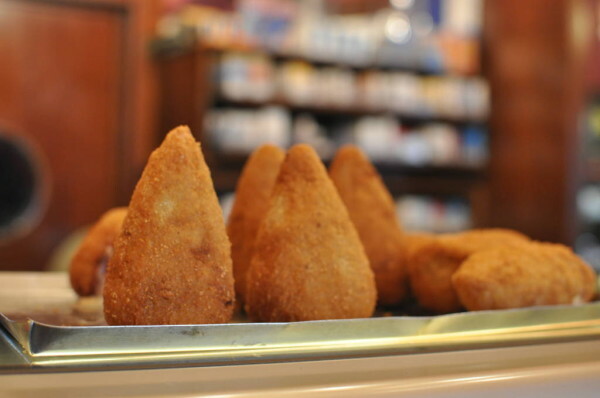 Below are 5 shops around Rome that serve these classic rice balls. Located in the historic center is this small, cozy and inviting place. You can plop down on the old fashioned leather sofas and eat around the coffee tables or have a seat at the bar. Supplizio is a little more adventurous when it comes to their selection, reinventing classic fast food with exalted ingredients. Offerings include carbonara, cheese and pepper and the classic supplì. They are fried when you order them so they’re served crispy and hot. Located in Trastevere, this is a takeaway shop with Italian cuisine including pizza, pasta, and of course supplì. The chef doesn’t get too wild and crazy with the selection. Try the classic supplì filled with rice, tomato sauce, and a warm gooey mozzarella center, rich and flavor-packed. This is the ideal place to get a taste for the original Roman snack. This is a completely gluten-free shop located in the historic center on Via di Torre Argentina. Pandali opened its doors in December and have a vast selection of pastries, pizza and sandwiches and even Italian snacks like supplì. Although the gluten-free version is lighter and less crisp than an ordinary supplì, it’s a wonderful option for those who are gluten intolerant or have celiac disease. Trapizzino in Testaccio has taken street food to another level. Stefano Callegari, owner of Trapizzino, has made pizza the base for his trapizzino (a hybrid of pizza and the tramezzino – an Italian triangular sandwich – stuffed with Roman classic sauces). Stefano keeps the methods of his family traditions, the constant tinkering of chefs, grandmothers’ tales, secret ingredients and personal invention together, with the intent of making the best Roman cuisine. He also makes gourmet supplì. Supplì (A)Matriciano contains guanciale (cured pig’s jowl), tomato sauce and is rolled in pecorino cheese. The extra crunchy outside provides the perfect bite. 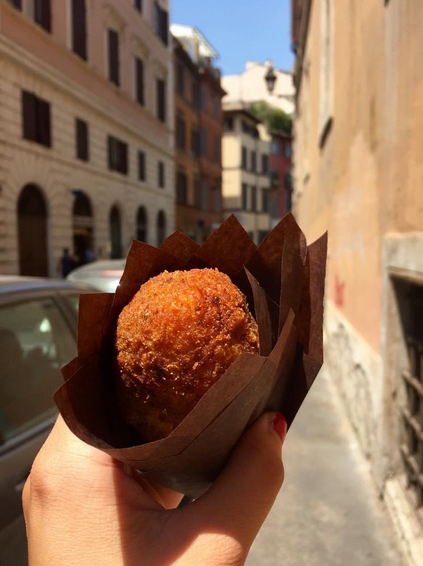 Dess’art in the Testaccio market is the destination for arancini. While the outside of the market looks modern and ordinary, the inside is cheerful, full of colors and different shops. Dess’art offers the classic arancini with ground meat and peas in addition to ham and cheese. If you love pistachio nuts order le mini Ragusane al Pistacchio (mini arancini filled with pistachio nuts and Ragusano cheese; a PDO cheese made exclusively in provinces of Ragusa and Siracusa with 100% whole milk from the Modicana breed of cows). Katie is an American student and self-proclaimed professional eater, ready to sink her teeth into everything Rome has to offer. 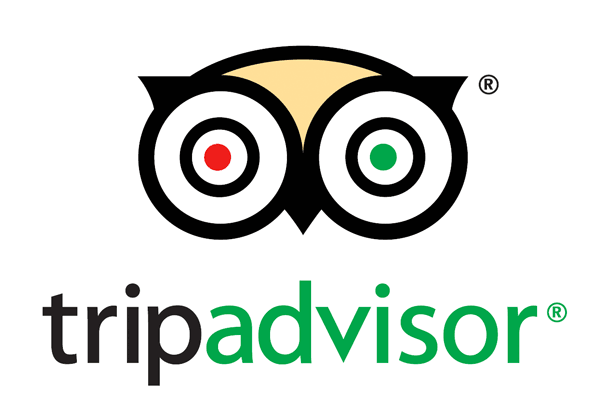 She is enthusiastic about exploring Rome “Italian-style”, making Casa Mia the perfect fit for a unique and fun summer internship.